“The buck stops here” – the sign on US President Harry S Truman’s desk. This is on you Todd Greenberg. This total disgrace of officiating is 100 per cent on you. You are the NRL CEO. How it is run is your responsibility. The NRL is not a sporting competition that can afford to be run by incompetents and amateurs, like a local footy club. It is a very serious business. It is a professional sporting organisation in which 16 clubs spend over $150 million a year just on the players wages. Where the broadcast deal is worth over a billion dollars and climbing. Where the number of signed up club members is higher than ever before. That scenario demands excellent administration. You are clearly not providing that. The total rolling debacle of match officiating is testament to your failure. The NRL Bunker is the total joke of Australian professional sport. And don’t you dare try and blame shift. Don’t you dare try and put this appalling state of affairs back on the officials. Don’t you dare try and treat these latest officiating incompetencies as isolated. They are endemic to the organisation that you have overseen. This is on you. The buck stops with you. You were the football operations manager when Tony Archer was appointed and when Archer in turn appointed Bernard Sutton as his right hand man. As CEO you have retained both in their roles and promoted them – without any apparent recruitment process involved – this season. You were the CEO who oversaw the institution of the Bunker, how it works and who operates it. You are the person in charge of it all. The buck stops with you. I, like so many others, supported you to the hilt when you instituted your penalty crackdown at the start of the season, only to see that bold initiative slide away under the barrage of dinosaur demagogue criticism it was subjected to. How are we fans now not supposed to think that your organisation is not beholden to those entrenched interests? And now you’ve overseen probably the worst debacle yet. Your touch judge clearly raised his flag. Whether he was right to or not is immaterial. Play had to stop. There is no acceptable alternate position. However, your referee failed to act on it and your bunker somehow awarded a try – that your own organisation’s web site says cost the Raiders the game. At any point, common sense could have prevailed but at no point did it do so. Gerry Sutton absolutely had to stop play the moment Rick MacFarlane’s flag went up. Once it went to the Bunker and they saw the flag had gone up they had to call it no try or send it back to Sutton as ‘refs call,’ advising of the raised flag. At a time that the NRL is facing monetary issues and the officiating is constantly going wrong, why aren’t Archer and Bernard Sutton actually manning the bunker themselves? What reason can they possibly have for not being there? What more pressing roles are they performing? These are questions Todd Greenberg should really be putting to his charges. Just like last week, when Sean O’Sullivan’s blatant knock on was deemed a try by the bunker officials, the issue for these abject failures isn’t the technology, it is the people using them and the flawed methodology they are being told to use. Archer and Sutton are clearly not capable of putting in place effective procedures. The awarding of the Sione Katoa try, while appalling, is just the latest travesty in this long-running debacle. And that’s on you Todd. It’s totally on you. You are the boss. You’ve hired and promoted the clowns running this seemingly endless circus. However, I’m betting the buck absolutely won’t stop with you. My bet is that since the 60th minute of Friday night’s match, most of the action at NRL Central has revolved around blamestorming and the imperative of finding a scapegoat. Making sure that the buck keeps moving. Here’s my prediction for what will now happen. – Tony Archer won’t take or have any responsibility attributed to him whatsoever for this debacle, in spite of him being in the newly created supremo role Greenberg promoted him to. – Sutton will blame the incident on MacFarlane raising his flag and say he shouldn’t have – and also possibly on Henry Perenara and Luke Patten in the bunker. He won’t be held to account in any way. 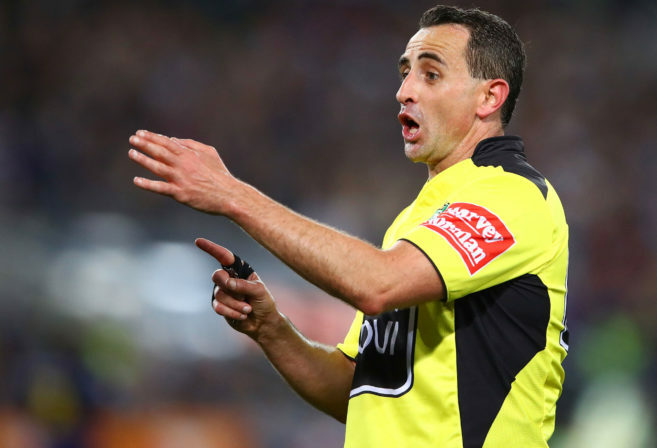 – Unlike the demotion earlier in the season of Matt Cecchin for unknown and unstated offences or deficiencies, no responsibility or reprimand will be attached at all to Bernard’s brother, Gerry and his blatant failure. – Rick MacFarlane will be dropped from the NRL. – Henry Perenara may get apportioned some blame. 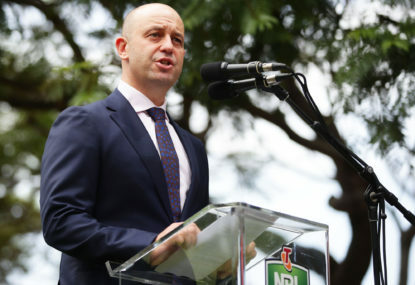 – Todd Greenberg will do absolutely nothing. And here’s the thing: these officiating debacles will continue until someone has the courage and integrity to fix the root problem. The incompetents in charge of the officials must be removed. The constant stream of officiating debacles we have endured under Tony Archer and Bernard Sutton’s regime has clearly shown their inadequacy and unsuitability for their roles to anybody who is paying any attention. I sincerely doubt the courage and leadership to remove them will emanate from ARLC Chairman Peter Beattie or the other commissioners who sit on what many feel is nothing more than a ceremonial and toothless committee. So I’m pleading with you Todd: do your job. It is crystal clear what needs to be done. Remove Archer and Sutton and find us some people who can ensure that the match officiating is carried out well. The inevitable scapegoating and throwing of poor Rick MacFarlane under the bus will be a pathetic, all-too-predictable and shameful treatment. It is not acceptable or fair in any way. The NRL is a serious business that can not have any tolerance for such repeated poor performance. And the buck stops with you.